M.E.D.S. is the only system capable of testing multiple engine platforms with one package. No more fumbling with multiple computers and programs. 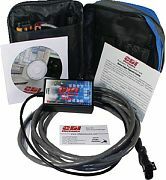 The system is designed to be installed quickly and easily onto your Windows based computer. Your platform provides the software interface, USB adapter, optical isolation (to prevent damage to your computer). Check the CDI website for the most up-to-date engine application information.